The breaking news this week was the insanity that broke out in a local city council meeting. We received a tip before the show that a PINAC corespondent was arrested after trying to enter a city council meeting. The interview with witnesses by Carlos Miller can be found HERE. We talk more about this later and even have Carlos join us LIVE. Next, we talked about a story out of Pennsylvania. A state police officer violated a teacher there after mistakenly IDing her based on a blurry Facebook picture. “I called the state police barracks and spoke to an officer who assured me that I would know if I was being charged with a crime. She scoffed at me for getting worked up over these “marketing letters” from lawyers. You can read that full story HERE. Next, we hit on an update to another story out of PA. Justice for Sugar was the name of the group fighting for justice for a cat that was shot and killed by a police officer. The final update on the case is a sad one. The officer was found not guilty of any crime at all. Find the whole story HERE. Our final story of the first half was a fun one. Activist Brett Sanders pranked his local police on the new cell phone driving laws. He created a fake, wooden cell phone and drove through the area pretending to be talking on it. That full story can be found HERE. When we came back from our break we laughed over the irony of a story out of Louisiana. The police there have began arresting people that are trying to rescue other people trapped by the flooding there. Cops seem to not like when anyone moves in on the monopoly they have on protection services. That story can be found HERE. Next we jumped to an update to a viral video that showed an officer pepper spraying a group of bikers as they drove past him on the highway. A Texas cop will receive almost no disciplinary action despite a damming video showing him pepper-spraying a group of bikers traveling past him on the highway. Fort Worth police officials said on Friday that an internal affairs investigation into the incident has concluded and that officer W. Figueroa will not be suspended and only receive minimal “internal sanctions.” Video uploaded to social media showed a group of about 20 bikers come upon the cop, who had a red pickup truck pulled over in the 1500 block of U.S. Highway 287, near East Maddox Avenue at around 3 p.m. on March 13. Figueroa is seen in the footage, pepper-spray in hand, aiming the can in the direction of the bikers before discharging it into the wind. The video then shows the bikers veer to their left in attempt to avoid the mist.You can read the full story on that HERE. Our final story and highlight of the show was a call from Carlos Miller live on the scene of the arrest of one of his corespondents. He was gathering witness statements and figuring out what could be done to get his reporter released. The sad truth was that since it was so late the reporter was going to be held till the morning. Be sure to tune in next week when we will have an interview with the reporter himself. 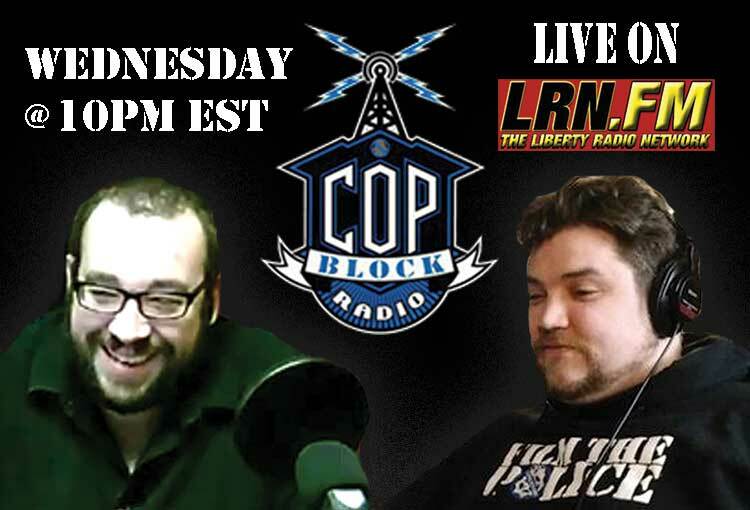 We air live every Wednesday at 10 pm eastern at Copblock.org/show.